On the 26th of May – in the run-up to Trinity Sunday, and in accordance with Moscow tradition – the well-known television host and journalist Vlad Piskunov will be holding a tea-party round the samovar… which we’ll be setting up in the main dining-room of our restaurant! There’ll be pastries and bread-rings, raisins and candied fruits, honey and jam! Plus a shot or two of aromatic rye-distilled Polugar. We’ll be heating up our 100-year-old samovar, to show you the authentic Muscovite way of brewing types of China tea which were popular in the nineteenth century. We’ll be offering a tea-tasting of the best varieties – sugared to taste. We’ll recall how they used to drink tea outdoors – at Sokolniki, at Marina Rosha, at Presnya. You’ll hear the story of Russian tea, of snacks with tea, and the strong liquors usually served alongside the tea. You’ll also find out what the correct cup-and-saucer for tea is, and about different kinds of Russian porcelain tea-services, samovars, and metal tea-glass holders. 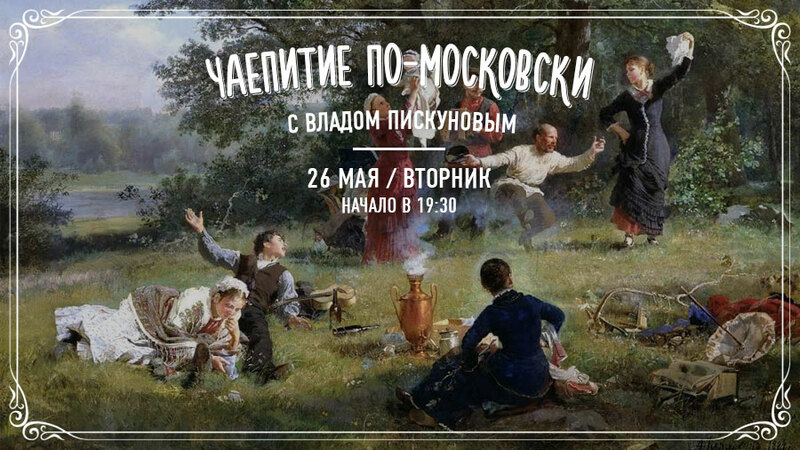 Our tea-party is part of the “Moskovsky Obed” (Moscow lunch) program. The participation fee is 2000 roubles per person.